The snow in the high country has finally melted away and the elk are in their summer feeding patterns. So I figured it was a great time to head into the wilderness area that I would be hunting this year and snap a few photos through the spotting scope and see what kind of potential this unit had to offer. 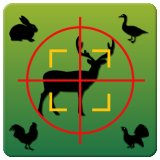 Here are the tactics that I use to find a new hunting area. 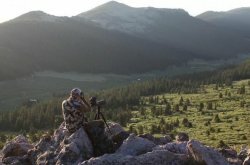 If I’m planning on scouting an area that I’ve never hunted and it’s a general over the counter tag, I will look at a topographic map and find a glassing position that will give me a 360-degree view of the areas around me and is between 11, 500 and 12, 000 feet in elevation (tree line or above). Doing this will allow me to get full use of my binoculars and spotting scope as well as keep me out of the elks’ living quarters. Bring high-quality optics because after hours of glassing, low-quality optics can give you headaches that will drive you off the mountain. Once I pick my glassing position, I find the quickest route to get there without disturbing the elk on the way. Once I get to my scouting position, I start glassing with a high-powered binocular (for this trip I used 12x 50 Swarovski EL’s). During the summer I look for a total number of elk in the area. Once I have determined that the area has at least 200-300 total elk, I will then start picking all the bulls’ antlers apart with my spotting scope. If I find at least 1 or 2 bulls that hit the 350-inch mark and another 10 to 15 bulls that will gross score around 280-320, I know I’ve found an area worth hunting. For scouting I use a Swarovski 80mm spotting scope. The 80mm objective allows me to gather an unbelievable amount of light in those first few minutes before the sun comes up as well as those let few minutes of daylight when the big boys always seem to show themselves. One trick I use to get a better look at bulls is brining a point and shoot camera and a digiscoping kit. I can snap photos of potential shooter bulls from more than 3 miles away and take an even better look at them on the computer screen when I get home (for photos of bulls from my last scouting trip click here). Once I have all the elk accounted for and find an area to hunt, I need to figure out exactly where the bulls will be during archery season. To do this I have a method that has worked well for me in the past. I take a protractor and adjust it so it will draw a circumference on the map of 2 miles around me in every direction. I then look at every area on that map that is inside that circle that I think could hold elk during their rutting period. I’m mostly concentrating on water sources, large grassy areas that elk will need for rutting activity, potential wallows and food sources. When I have specific points of where elk will be during archery season, I plan another scouting trip to head into those specific areas. When I scout these areas, I don’t look for elk, but for areas and sign were elk have been. These things should stick out … rubs on large and small trees, wallows that have been used in the past and, one of the biggest tell tail signs most hunters seem to overlook, bones from elk that have been harvested by other hunters in previous season and bulls that have been skull capped. Also, keep an eye out for marking ribbon left over from hunters working a blood trail trailing. Now I know you don’t want to be hunting an area that is over run with hunters by any means, but when you hunt as far in as I do, this is normally not an issue and I always expect a few hunters to be in the area. 1) Buy the highest quality optics that you can afford. 2) Let your optics do the walking for you. 3) Don’t plan on hunting the areas that the elk are feeding in during the summer, because more than likely they won’t be there during archery season. 4) Try and pre plan your campsites ahead of time, but don’t ever lock yourself into one spot. 5) If the area seems to be overrun with campsites and outfitters, find a new spot. 6) If you have new gear, use the scouting season to test it out. 7) If you’re scouting for elk and seeing several deer at the same time, try to buy a deer tag. 8) Mark all potential water sources, wallows and important Intel on your map. 9) Try to plan your route in with the idea that you will be packing out and elk on the way out. So park your truck at the lower trial head! You will be thanking yourself on the trip out/down. Deer Calls: Contact Calls, Doe Grunt, Buck Grunt, Tending Grunt, Buck Bawl and much more. Elk Calls: Location Call, Chuckles, Spike Bull, Big Bull, Cow Call, Excited Cow, Bull with Cows and much more. Duck Calls: Basic Quack, Greeting Call, Feed Call, Hail Call, Comeback Call, Lonesome Call and much more. Turkey Calls: Cluck, Purr, Cluck & Purr, Putt, Tree Call, Fly Down, Assembly Call, Plain Yelp and much more. 18" moose elk deer hunter hunting bow hunter arrow tip Die cut white vinyl decal sticker great for that hunter. Plus A Bonus Bear Hunt Over An Elk Wallow And Much, Much More! Diamond Creek is an intermittent stream that flows through the Hualapai tribal reservation generally north from Peach Springs, Arizona to the Colorado River. The improve golf swing -It is means finding ideas motor sport.